Usually we find out by accident that Grandma was born in a home for unwed mothers. Sometimes, we figure it out, by the surname throughout her historical records, where a father is not listed, or the maternal family surname is the only one used. Sometime, we just deduce it correctly, when the family lived in rural America, yet, Grandma was born in a woman friendly town like Kansas City. Who was Grandma’s father will always be a family secret, or, the gossip of the hometown, but perhaps more information can be found in the records of the place of birth, especially if it was a home for unwed mothers. Homes for unwed mothers and “troubled” women were becoming a common place by the early 1890’s. 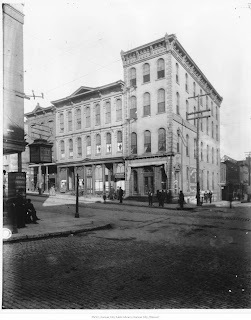 As early as 1869 the sisters of St. Vincent opened The House of Providence, a program for unwed mothers and their children, as did many other cities. By 1893 Charles Nelson Crittenton, grieving the death of his four year old daughter Florence who suffered from scarlet fever in 1882, founded Florence Night Mission. This Mission was designed to assist the prostitutes, troubled “lost and fallen women and wayward girls” of New York City. By 1895 Dr. Kate Waller Barrett, an Episcopalian minister’s wife and mother of six, joined forces with Dr. Crittenton. Dr. Barrett’s primary interest was to assist unwed mothers. After completing her nursing course in 1894 at the Florence Nightingale Training School in London and her medical degree at the Women’s College of Georgia, in Atlanta, she and Crittenton partnered to establish up to 73 homes for unwed expectant mothers across America. The National Florence Crittenton Mission became a well known safe-haven for unwed, troubled girls. Most of the homes served between 8-15 girls, but then there were the larger Florence Crittenton homes, like that in Kansas City. Other private homes for unwed mothers, or troubled women like “The House of Another Chance” in Seattle which opened in 1926, assisted up to 150 women. And the The Willows Maternity Home, founded in 1905, in Kansas City was noted for its significant influence in adoptions. Based on the times, the colored girls had their own homes for unwed mothers. In 1925 in Kansas City, there was the Florence Home for Colored Girls. 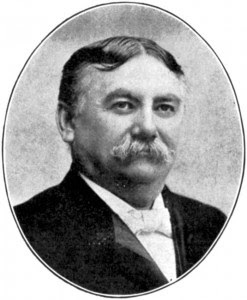 Although named after the Critenton’s daughter, it was funded by the philanthropist William Volker. According to statistics, Kansas City was the baby hub and a safe-place for unwed mothers. It was located in the middle of the US with convenient access to the railroad. A railroad map into Kansas City was featured on the “Interesting Willows’ Statistics” pamphlet printed in 1921 by Willows Maternity Home. At that time, Kansas City also was the home of the Florence Crittenton Home, The St. Vincent’s Hospital, Eastside Maternity Hospital (often called the Kansas City Cradle due to its close association and history, but this relationship is a bit misleading) and the Florence Home for Colored Girls. Be sure to check with State Historical Societies and manuscripts for these records. Note on Adoptions: Although the homes mentioned in this post historically encouraged the women to keep their child, the same homes were used as adoption agencies. Reprint of 19 May 2010, title of same name. 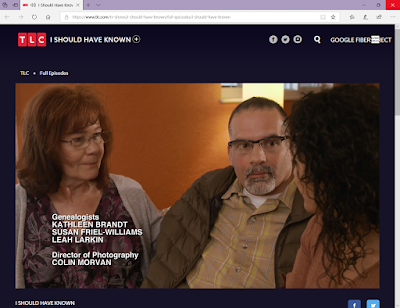 New Genealogy TV Show - "I Should Have Known"
The new TLC pilot, I Should Have Known, aired Monday, 26 Nov 2018. "I Should Have Known," proves to be much more than a genealogy show. Kathleen Brandt, of a3Genealogy (KCMO), is an International Professional Genealogist, Licensed Private Investigator, and a host of the show. She has joined others to help "Lindsay" and Francisco wade through their "new life secrets." Lindsey [sic] and Francisco's lives get turned upside down when they learn a life altering secret that makes them question who they even are? Now struggling with the fact they were lied to their entire lives, they each embark on a mission to uncover the truth. Be sure to sign into your provider to access the online full episode of the show. We'd love your feedback on the show. 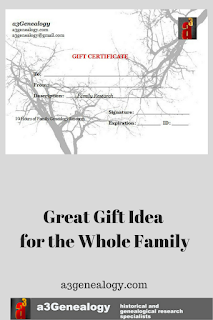 Need a Last Minute Gift Certificate? 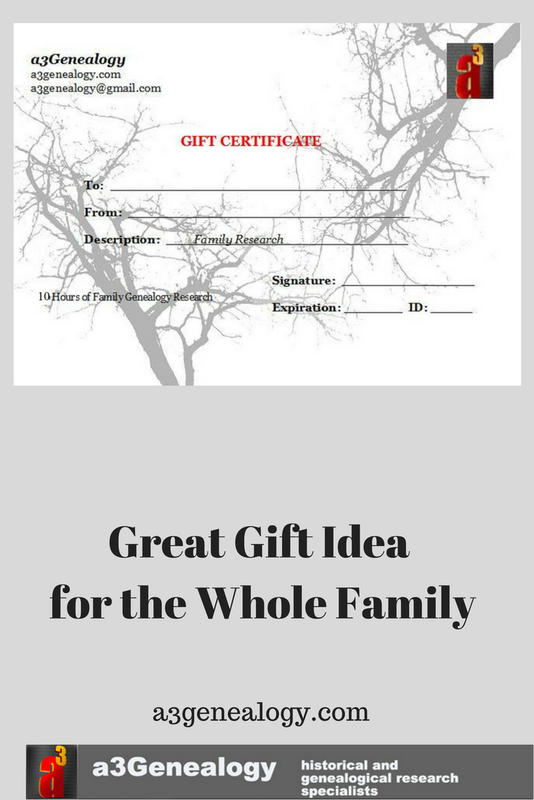 Code #88 extends a $50.00 discount on four of our most popular packages: 1) Basic Family Research Package 2) Consultant Package 3) Military Package 4) DNA Analysis Package. You must purchase research projects in 10 hour increments. Special Holiday Promotion Code #88 does not apply to other Packages to include Heirship Research Packages, Media Packages, Dual Citizenship Packages, or Adoption Packages. Promotion Code #88 expires 6 Jan 2019. 10 Hour Basic Family Research Package: This family research package typically includes two surname lines. Know that our research is not just an ancestry.com or internet searches but may include researching for military, naturalization documents, court records, and records held at Federal, State and County repositories. USA only. 10 Hour Consultant Package: This package is designed for the aspiring genealogist, but genealogy professionals often request it. Are you a family historian or genealogist and need help with your brickwall? You do the research, but we will be your partner and guide you via conference calls, emails and local meetings. We have experts across the USA and many overseas that can also coach you through local issues. We often assist in your document retrieval needs. 10 Hour Military Package: For your Revolutionary War soldier WWII veteran, and all those in between, we can design a research project to honor your ancestor. 10 Hour DNA Analysis Package: Your results are in, but what does this all mean? We can use DNA Analysis Package, to assist in solving a brick wall, planning a trip overseas, or even connecting you to your biological family. This is not a comprehensive Adoption Package, but this might be just the package you need. a3Genealogy Gift Certificates can be applied to any research project. Gift certificates are activated upon payment. 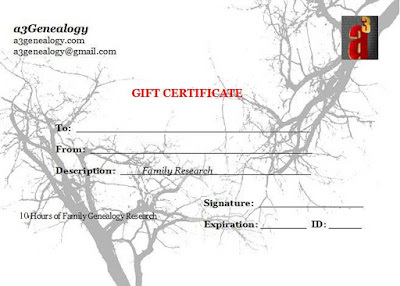 Contact us for more information, or make your holiday purchase here: Gift Certificate #88. Happy Holidays! Projects for Promotion Code #88 must be scheduled by 1 April 2019. All gift certificates are activated upon payments. Clients will receive an expiration and ID code to confirm activation. For phone purchase, contact Kathleen Brandt at 816-729-5995.